Gleichen has a vibrant history stretching back to before the founding of our Province, numerous famous and infamous individuals have called Gleichen there home at some point through out their lives. The history section of our community webpage is dedicated to those people who made our charming community the vibrant interesting place it is today. This main page will have general interesting historical facts on our community and where possible the web link to the original document has been provided. In addition some items are of significance to this community and deserve to have a more detailed history on them; in those case we have longer descriptions that required there on page. Below are the links to those pages or alternatively you can use the drop down menu above under history. Major-General Thomas Bland Strange – A prominent figure in the Riel Rebellion and the father of the Canadian Artillery Corps. The Gleichen Hardware Store – The history on this historic building. The Larkin Block – A historic building from our earliest history. The Masons – They had a lodge here in our early days. Our Water Tower – A symbol that can be seen for miles around. The history of Education in Gleichen. The Gleichen Call history book is named after the Gleichen Call Newspaper which ran from 1907 to 1956 old issues of the newspaper can be seen online on the U of Alberta web site here, The newspaper was called the Gleichen Newspaper for the first couple of issues then was renamed the Gleichen Call. A 1884 book called A tour through Canada, from Nova Scotia to Vancouver Island, has a lengthy description of the community of Gleichen and is one of the earliest descriptions of our community. The writer talks about the CPR test farm; the coal mine; the peaceful natives; and the fact that the land is well suited to agriculture and has a milder weather than Calgary and that the CPR is planning for Gleichen to be the new hub of trade rather than Calgary. In 1912 the Gleichen call reported that they had seen Santa Claus walking past the newspaper offices to deliver toys. A 1947 book titled Early medicine in Alberta: the first 75 years has the following to say about Gleichen. In 1886 DR. N.J. Lindsay was appointed by the Government to look after the health of the Blackfoot Indians on the Siksika Reservation and the NorthWest Mounted Police in Calgary and was stationed at the Gleichen siding for a time. His territory extended from Gleichen to Donald. Dr. Frances E. Windsor was one of the first female doctors in the west and she lived and practiced in Gleichen. She was already in practice when Alberta became a province and she like all other doctors had to register with the new province. Dr. Henry Turner settled in Gleichen in 1898 and was registered with the Government as a doctor. Dr. William Rose (he was mayor of the town in 1911), graduated from the University of Toronto in 1900 and was registered as a doctor living in Gleichen that same year. Dr. George Howard Farquharson graduated from the Western University in 1908 and took up practice in Gleichen. A January 26th 1916 advertisement in the Gleichen Call says that C.R. McIntyre is now working out of the Royal Bank Building; he is listed as a dental surgeon L.D.S. and D.D.S. and he administers gas. In 1907 the Alberta government had the following expenses associated with the Town of Gleichen. A Dr. W. Rose of Gleichen was paid $13.85 in coroner fees. The Gleichen Call was paid $4.20 in advertising fees for publishing the new steam boiler rules and ordinances. The Province collected $1,515.28 in taxes from Gleichen and district, but spent over $2,000 on salaries in the district; $672 in roads; $221 in bridges; and $42 in fireguards. On August 19th 1920 the Gleichen Board of Trade in Conjunction with members of the Council of the Siksika Nation gave a tour of the area to a British delegation including Viscount Burnham, you can read the program from that event online. 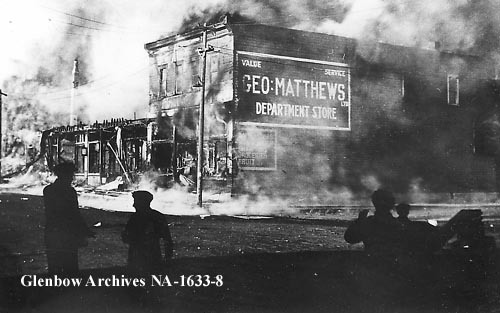 In 1923 a fire destroyed most of downtown Gleichen including the Opera house. An additional picture can be seen here. A 1939 Provincial directory of manufacturers in Alberta lists numerous ones located in Gleichen. Including a bakery; and other endeavors. In the 1914 provincial Gazette you can see that Emile Griesbach (the first mayor of Gleichen) has a large dance hall advertised in it. Unfortunately for us the pages listing all the other businesses in Gleichen have been lost to history (pages 679-680) all that remains is the last Gleichen business listed on 681 which is the dance hall. The 1911 version of the Gazetteer has multiple pages of businesses listed and says that Gleichen is a fine community since it has a ‘completely equipped school for its educational progress‘; it also says that ‘an efficient fire service is one of the attributes of the Town‘ an attribute we share with our forefathers. The population is listed as 800 and the mayor at that time was Dr. W.M. Rose and during that year Gleichen had four different active churches Anglican, Presbyterian, Lutheran and Roman Catholic. Gleichen is listed on pages 483, 484, 485, 486, and 487. For reference Calgary had a population of 55,000; Stettler had 1,800 and Strathmore had only 650 in 1911. In both 1901 and 1911 the federal government of Canada conducted a census of the people of Gleichen. These can be viewed online and show a marked increase in population from 1901 to 1911. A report by the Alberta Government for 1911 showed that they added 28 new telephone services to Gleichen that year. Gleichen was also home to eight 3rd class steam ticket holders – Norman and Orrin Arrison, Jas Walker, Jas Wilson, Geo Scott, Leonard Turner, Milo Munroe, Frank Robertson; also listed is a John Morrison who was a 2nd class steam ticket holder. The same report showed that several lots in Gleichen where forfeited for back taxes that year – lots 17 and 18 block 1 and Lots 5,6 and 7 Block B. The 1911 Canadian Pacific Rail rates flyer showed rates from Sharbot Lake in Ontario to various common destinations in the western provinces. The rate for a 2nd class passenger ticket to Gleichen was $36.10 and the charge for freight was a $1.10 per 100lbs for less than a full car load and 55 cents per 100lb for a full car load of freight. From 1920 to 1946 Gleichen was the home of the 22nd Battery a reserve artillery unit. The 22nd (Reserve) Field Battery, RCA originated in Gleichen, Alberta on 2 February 1920, when the ’22nd Battery, CFA’ was authorized to be formed (GO 13/20).It was re-designated: ’22nd Field Battery, CA’ on 1 July 1925 (GO82/25); ’22nd Field Battery, RCA’ on 3 June 1935 (GO 58/35);’22nd (Reserve) Field Battery, RCA’ on 7 November 1940 (GO 273/40);and ’22nd Field Battery, RCA’ on 14 November 1945 (GO 52/46). 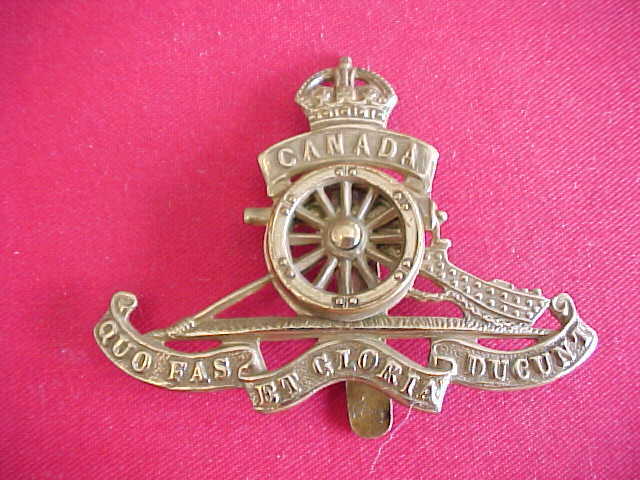 On the first of April 1946, it was amalgamated into the ‘15th (Reserve) Alberta Light Horse‘. The Glenbow museum has in it’s collection all orders and records from the unit for the years 1938 to 1940 but these are not available online. In 1927 it was perpetuated as part of the Alberta Light Horse (GO 83/27). In 1909 John C. Buckley attended the Alberta Provincial Seed Fair in Calgary and was awarded the Championship and Farm Crops trophy for his wheat. That same year John McEwen set a record of 91 bushels per acre of wheat when the average was 50 to 60. Articles say this was because of the newly completed irrigation district. In 1908 Gleichen hosted a group of dignitaries traveling across Canada on behalf of the Scottish Agricultural Commission. In 1921 a Provincial report stated that the Town of Gleichen had 600 citizens, $342,295 of assets annual tax income of $10,057.37; a town debenture of $53,000 and a debenture of $15,000 owing for the school. In 1947 Gleichen had a tax income of $16,744.69 and a municipal value of $262,642. The Province had surveyed and found that the Gleichen Coal seam had a recoverable reserve of 88 million tons. The 10 year average production of the mine was 20,000 tons per year which accounted for less than 0.25% of Alberta’s total production. The population was only 477 people, but had 3 manufacturers who employed 7 people and produced $27,000 of goods. Gleichen was part of Provincial census district #6. 142 Students where enrolled in the Gleichen school which included a High School. Gleichen was home to the Blackfoot hospital. (technically it was on Siksland not Gleichen). Gleichen was home to the Salvation Army Eventide Home for the Aged and Infirm. Which was a 115 bed facility. Gleichen had one bank which was a CIBC. The weather range for Gleichen was listed as a high of 50F and a low of 23F with a yearly average of 36F. The average annual rain was listed as 14.28 inches and the average annual snow was listed as 32.2 inches. The same report listed Gleichens population had been in each of the previous census years. Population of 101 in 1901. 583 people in 1911 ( a different Government document says 800 for this year). A 1948 Travel Alberta brochure had one hotel listed in Gleichen called the Queen’s Hotel which had 30 rooms and charged a dollar a night. A history book titled When the steel went through was published in 1947 and was written by a P. Turner Bone who had worked for the CP Rail in his early days and had helped run the rails through Gleichen. Mr. Bone was put in charge of laying out for the building of the roundhouse and turntable Page 51, 52, 53 and 54. He comments that he thought it was funny that from the first day that they named the siding Gleichen it was pronounced ‘Gleeshen’ by everyone which is the wrong pronunciation. He also says that he met the Archdeacon Tims who was working on the Siksika Nation. He says that it was in about 1883 that they put in the roundhouse and turntable and during it’s construction is when the name Gleichen was decided for that siding. According to a document by the Alberta Dairyman’s Association a creamery was established in Gleichen sometime between 1910 to 1914. A 1915 Federal Government document titled The last and best West: Canada in the twentieth century: Western Canada vast in agricultural resources: Homes for millions, had a section on wheat yields in the western provinces (it was intended to encourage people to emigrate to the west). It states “Big yields are not confined to small acreage. Mr. F. Corbeil of the Gleichen District threshed 17,000 bushels of wheat from 290 acres, yielding a little better than 58 bushels per acre. Field of oats yield over 104 bushels per acre.” The same booklet mentions that several farmers near Taber are experimenting with trying sweet corn in plots from 1 to 25 acres. When the HMS Titanic went down on 14 April 1912, a Mr. Thomas Rowan Morrow (age 30) of Rathfriland Ireland was on board and according to the manifest his ultimate destination was Gleichen Alberta. He did not survive the sinking of the ship. He was on his way to Gleichen to work with his brother Waddell Dickson Morrow who had immigrated in 1904 and was working on a local ranch. There is a full history on Mr. Morrow here. He left behind his widowed mother Anna and a sister Sara.